Let’s Build an Adventure Lab Together! For more than 12 years I’ve dreamed about launching a project for women over 40 who want to have epic adventures on a shoestring budget. I wanted to create something that made it easy to share ideas, tools and resources. I wanted to empower women to tell their own stories, and dream big, regardless of financial means. I wanted it to be something that was more than a business: it needed to be a launchpad that also embraced women at risk for whom the idea of an adventure doesn’t look much further than basic survival. I promised myself that I would cultivate it as an experiment that allowed me to test-drive bold ideas with very little money, with other ordinary women just like me at my side. Last I made good on that promise. On December 12th I received my master business license for “Rock Paper Estrogen”. 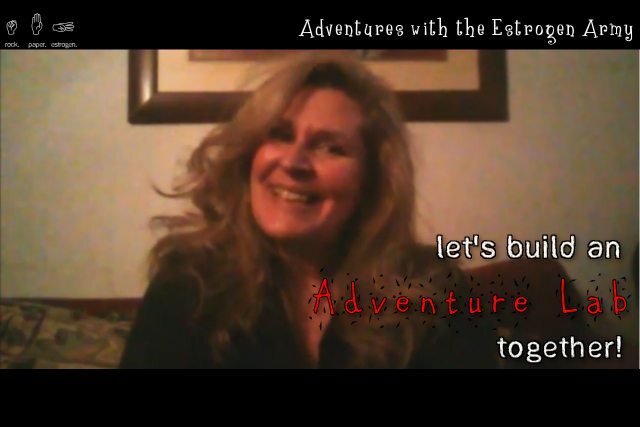 Last night I publicly opened the doors here at the “Adventures with the Estrogen Army” project web site. Now I’m inviting you to help me build an “Adventure Lab” to make it easy for women around the world to tell their own stories in a way that empowers both themselves, and others, regardless of financial means. If you’re still hunting for that perfect Christmas/Hanukkah/Kwanzaa gift for your mum, your sister, a friend, or some Adventure Diva in your life, why not pop over to Indiegogo and sponsor the Adventure Lab project in her name for as little as $10? You’ll be giving her a lifetime of adventures, and she’ll be permanently recognized as a “Founding Member” both here on our web site, and in workshop and course materials. And ladies, this is one year you’re not going to break those New Year’s resolutions! January 1st is right around the corner, and whether or not you join in as a sponsor, I hope you’ll join me at the digital kitchen table to start sharing your dreams and plotting your own epic adventures! Thank you for helping in whatever capacity you can. I appreciate it more than my words could ever convey!